Aug. 22, 2012 - PRLog -- Busy Bee Ceramics is a range of handmade Irish Pottery ideal for all gift occasions including Wedding Gifts,Personalised Baby Gifts, Birthdays Gifts,Presentations and Corporate Business Gifts. Bread 'n' Butter Green Range - Cup and Saucer. Finished with a shamrock design. Other pieces available in this collection are goblets, jugs and mugs. Each Piece is handcrafted using traditional methods of throwing on the potter's wheel ,rolling & sculpturing. 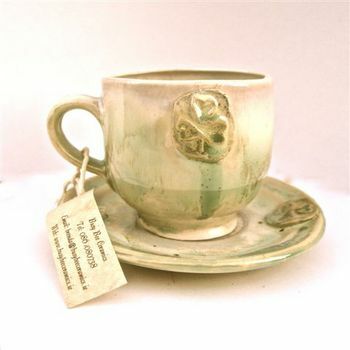 Every product is stamped with the "Made In Ireland" stamp and the "Busy Bee Ceramics " stamp. "What I love most about this range is it's uniqueness in quality & design. No two pieces are ever the same ,and it is their character that interests me most.."
Each product comes complete with its own description and story card. All Busy Bee Ceramics are Gift Boxed and packed securely for shipping from Ireland.